John M Armleder has worked for more than thirty years, starting off in the 1960s as a performance artist in the Fluxus inspired Geneva group Ecart (trans. French for ‘diversion’). Rather than work out of a studio, he travels, using galleries as studio spaces, working up shows in response to particular spaces, opportunities, possibilities. 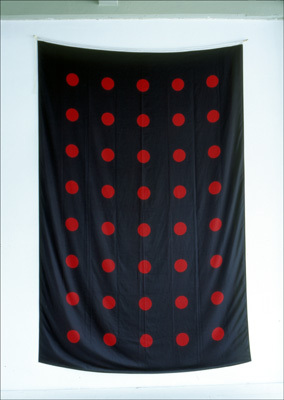 Here a flag of dots was made for a flag project in The Netherlands in 1988.